1963 – Boxing Match, Revisited explores a little-known yet influential exhibition that took place in downtown New York at Gordon’s Fifth Avenue Gallery from February 27 – March 24,1963. The original exhibition featured sculpture by Shusaku Arakawa, Robert Morris, Ay-O and Masunobu Yoshimura. These artists’ paths converged in the early 60s when all four independently relocated to New York City and quickly became immersed in the city’s flourishing avant-garde art scene. Boxing Match emerged out of these artists’ recognition of the formal affinity between their work, which shared a basic box shape. Among the works include in the exhibition were several large, four by eight foot, “coffins” by Arakawa. In a review for Arts Magazine, Donald Judd described these pieces as “Surrealist” “monsters”—lined with pink silk and sporting additions such as “a phallic tail of foam rubber.” These over-the-top coffins contrasted with the understated work of Robert Morris, who debuted his sculptures Column (1961), Untitled (Cloud) (1962), and Box With The Sound of Its Own Making (1961)—works that eventually became defining examples of the Minimal art. Ay-O, was represented in the show by a series of small square boxes titled Square Sun ‘61. The illuminated interiors of these works were pierced with nails, producing a visual effect that resembled rays of sunlight. Yoshimura contributed a group of “columns” and “coffins,” echoing the sculptures of Morris and Arakawa. These work were made of rippled plaster studded with knobs made out jello molds. 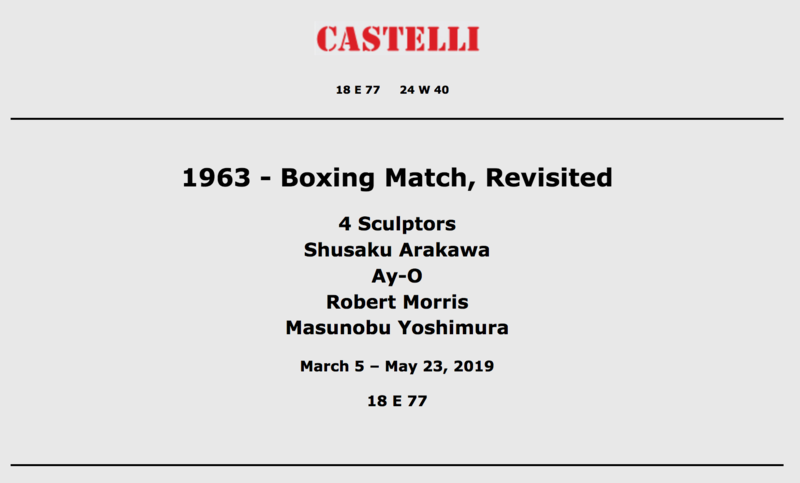 Although many of the sculptures from the original exhibition have since been destroyed, 1963 – Boxing Match, Revisited will include works by all four artists dating from the 1960s, which exemplify each artist’s distinct set of aesthetic concerns during this period. These pieces will be shown alongside photographs and ephemera related to the 1963 exhibition. Through this presentation, Boxing Match, Revisited aims to excavate this all but forgotten moment in post-war art history, bringing attention to its significance as the first exhibition of Robert Morris’s Minimal works as well as a precedent for the seminal Boxes exhibition held in 1964 at the Dwan Gallery in Los Angeles. Perhaps most importantly, the show highlights the creative exchanges taking place between American and Japanese avant-garde art groups during the 60’s, which were integral to the developments of movements such as Pop, Minimalism, Fluxus, and Conceptual Art.